Polygon Solutions Inc. continues to expand the variety of rotary broaches it is manufacturing. This gear shaped rotary broach can be used to make holes with the matching form using a lathe or mill. Common methods of hole preparation include using an oversize pilot hole to create individual chips at each tooth, or using small end mills to remove as much material as possible before finishing the hole with the broach and broach brake. Custom rotary broaches fit into Polygon Solution’s standard adjustment free rotary broach holder, or can be made to fit adjustable broach holders. Standard rotary broach dimensions are .500″ shank diameter x 1.75″ length. Swiss broaches have an 8mm diameter shank and 1.25″ overall length. Broach materials include hardened M-2, M-42, PM M-4 or PM T-15. Coatings are also available. 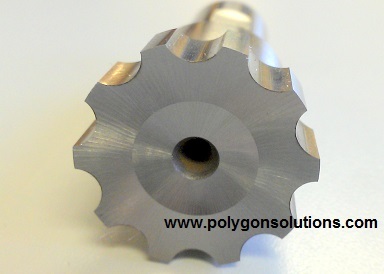 Gear shaped rotary broaches are another example of Polygon Solution’s innovative machine tooling. Even when rotary broaching may not seem practical, Polygon has been able to help customers interested in rotary broaching these forms to create custom tooling using multiple roughing and finishing broaches. This method of using multiple broaches mimics the multiple teeth of convention broaches, but can eliminate secondary operations. For more information, please contact sales@polygonsolutions.com, or (239) 628-4800.